You might be surprised to discover that the city you live in has a King as well as a Mayor. Or to learn that the terms M'lord and M'lady are still used by some people on a frequent basis. Or that some people know luxeuil minuscule is a style of 11th Century calligraphy, not the latest two-door sedan from Mercedes-Benz. You might even be surprised to know that there are people today — possibly living right in your neighborhood — who dress in clothing from the era of King Henry VIII, put on armor and duel with spears and broadswords, can accurately shoot a 14th Century longbow, spend weekends living in big, brightly colored tents called pavilions, and who can be thrown into fits of laughter by jokes about... Vikings. If you are surprised about all of those things, then you're probably not familiar with a group called The Society for Creative Anachronism. Founded in 1966, the SCA is an international organization dedicated to the re-creation of the Middle Ages and Renaissance — the period of King Arthur, Robin Hood, and Ivanhoe. For those of you who are up-to-date on your medieval history, the SCA covers the period (roughly) from the time of Charlemagne to the time of Queen Elizabeth I. It's hardly an exclusive club; the SCA has some 25,000 paid members throughout America, Canada, Europe, New Zealand, Australia and the Far East. "Ah, yes," you might say, "I know all about that group. I've been to several Renaissance Faires." Not so fast — there's a significant difference. Renaissance Faires are performance-oriented events; they are staged for the enjoyment of paying guests, and each of the costumed participants has a particular role to play, or character to portray. SCA events (called tournaments) on the other hand, are participation-oriented events. 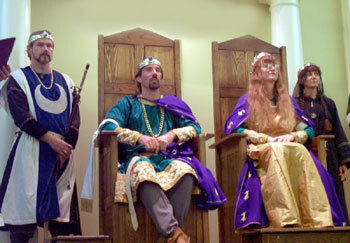 Although spectators are gladly welcomed at an SCA event, the activities at a tournament are put on by and for the members of the club, not staged for the guests. Does this mean you need to be a member of the Society for Creative Anachronism, or a knowledgeable medieval history scholar to attend an SCA event? Of course not! The SCA is known as a "living history" organization because it brings history to life for everyone, and makes the distant lifestyles of the Middle Ages and Renaissance very accessible and easy to understand. Members of the SCA welcome "visitors" from the 20th Century, and they love to share their knowledge of everyday facts and details of medieval life. How much does armor weigh? How can you spin wool into cloth? Why are manuscripts written in calligraphy? What ingredients are used when cooking a medieval dish? These are exactly the kinds of things that the members of the SCA investigate, and enjoy sharing with people at a tournament. Q: Do I have to wear a medieval costume? A: No. A lot of SCA events are held in public areas, like parks or schools, are there are plenty of people there who aren't wearing a costume, or "garb", as it is called in the SCA. Anyone is welcome to come and watch wearing any kind of clothing — modern or medieval. Q: Will I be able to talk to anyone there if I don't speak "Ye Olde Queen's English"? A: Forsooth, certainly thou shalt! (That means, Yes!) Remember, an SCA event is not a "performance", and the people there are not "in character". Most SCA members love to chat about their areas of expertise — armor, clothing, dancing, tournaments, or whatever. All you have to do is ask ... but be careful! A passion for medieval history can be contagious, and you may wind up with more questions than you started with. Before you know it, you'll be planning your trip to the next SCA tournament. Q: Will my children and family be welcome there? A: Absolutely. Although many people have seen pictures or heard stories of the armored combat in the SCA and think the group is only for athletes, or men, or people willing to get hit with a broadsword, there's a lot more to the group. The SCA is made up of men, women and children from all walks of life. Every event includes games for the children and pastimes like dancing and singing — as well as the sword-swinging, mail-chipping combat. Remember, the purpose of the Society for Creative Anachronism is to make history come alive. You'll see aspects of medieval life at an SCA tournament that you just can't get by reading a book or watching a movie. 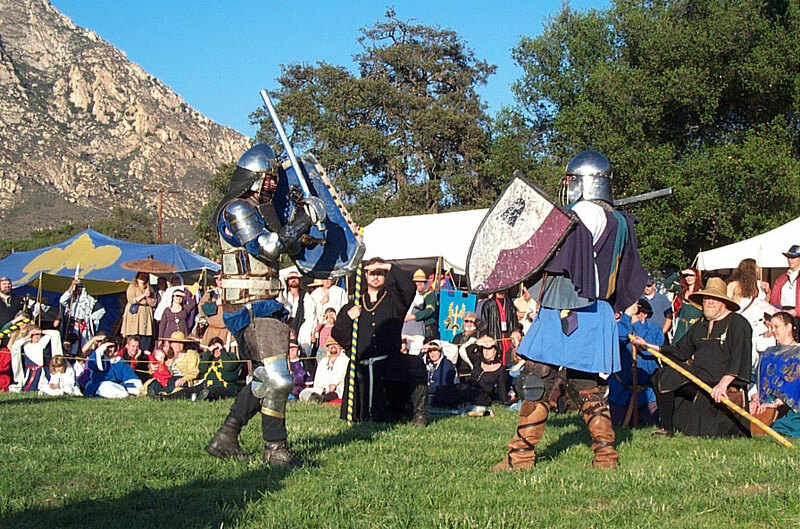 You don't need to be an expert on medieval history, Shakespearean literature, knights and armor, or any other aspect of the Middle Ages in order to enjoy an SCA tournament. Many SCA members knew very little about medieval history when they joined the group. Don't feel shy about coming to an SCA event. It's a great way to spend an afternoon in the park, and there's plenty to see and enjoy for everyone. Of course, not every Society for Creative Anachronism event is a grand, spectacular gathering like a tournament. Many SCA members meet weekly for smaller, more informal gatherings where they do much of the preparation work that is required to keep the group going. Warriors often meet weekly for a "fighter practice" where they can practice their martial skills without the pressure of tournament competition, and teach some of their tricks to the squires and new combatants. Artists attend frequent gatherings where they share research and expertise as they work on their various projects. Each SCA chapter has regular business meetings to discuss the group's upcoming activities. Newcomers are welcome at any of these smaller, less colorful functions, and they're great places to go if you want to get a practical, behind-the-scenes look at how things are done, and how you can get involved in the SCA. Although the Society for Creative Anachronism is an international organization, it is divided into regional groups called kingdoms, sixteen in all. Each kingdom is subdivided into smaller groups called principalities and baronies. There's hardly a major city these days that doesn't have an SCA branch chapter of some type, and SCA events can also be found in many suburban and rural locations. If you're interested in learning more about the activities of the Society for Creative Anachronism in your area, contact the chatelaine (that's the information officer) in your kingdom, principality or barony and find out when and where the group's next tournament is to be held. For more details about finding your local SCA chapter, visit the SCA main website and click on Locating an SCA group near you. You might be surprised at just how close you are to those knights in shining armor. "The King and Queen of San Diego"